THE ORIGINAL PURE .999 SILVER GUARDIAN ANGEL COIN! You are bidding on this b.. THE ORIGINAL GUARDIAN ANGEL COIN! PURE .999 SILVER You are bidding on this beautiful bra.. THE ORIGINAL GUARDIAN ANGEL COIN! PURE .999 SILVER (solid, not plated) You are bidding o.. THE ORIGINAL GUARDIAN ANGEL COIN! PURE .999 SILVER (solid, not plated) Brand ne..
High Quality 14kt Gold Diamond Coin Mounting. This beautiful designer pendant features .16 car..
* * * Pure .9999 (24kt) GOLD * * * GUARDIAN ANGEL COIN "MY OWN GUARDIAN AN.. PURE .9999 GOLD (24KT) 1/20 OZ. GUARDIAN ANGEL COIN. MOUNTED IN A BEAUTIFUL S.. 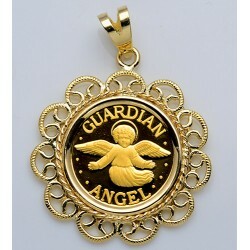 PURE .9999 GOLD GUARDIAN ANGEL COIN in 14KT GOLD DIAMOND PENDANT .75 CTS.